Chris graduated from the University of Missouri – St Louis in 1994 and soon after started in the financial business with a local bank. 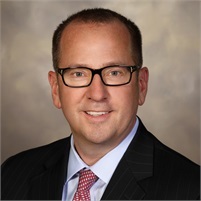 In 1996 he joined Edward Jones as a Financial Advisor starting a branch in the Chesterfield/Town & Country Missouri area and remained there through 2013, having considerable growth and success for his practice. In July of 2013, Chris joined Cornerstone Wealth Management/LPL Financial to more completely serve the needs of his clients. His clients are served from multiple locations. Chris is a CERTIFIED FINANCIAL PLANNER™ with significant experience with clients in every walk of life. Chris has served his community on the Salvation Army Midland Division Advancement Committee, Advisory Board, Executive Committee and the Central Territory Investment Advisory Board. Chris also served as Vice President for the Chamber of Commerce in Town & Country. As well as being involved with these organizations, he has been a coach for local hockey and baseball teams. He currently serves on the Board of Directors for St Peters Spirit Hockey Team which covers all of St Charles County and is one of the largest hockey clubs in Missouri. On the weekend, Chris can be found fishing, hunting or watching a hockey game with his wife Mary and sons; Blake, Brandon and Logan.